Though I’ll be the last person to complain about ANYTHING having to do with this beautiful country, especially my home city of Granada, it’s always always raining here. I hardly should be talking about bad weather, considering it’s snowing and freezing at home, but the rain and the sub 40 degree weather is not what I expected when I thought about going to the South of Spain. Although my afternoons have been spent wandering in the wet and cold, I have had amazing luck with the weather while I’m traveling. Two weekends ago in Rome it was in the high sixties! 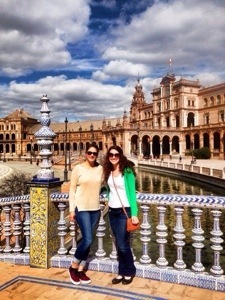 Equally, I had amazing sixty degree weather last weekend in Sevilla! We chose our hostel using a website called Hostel World which ended up being the best resource I have probably ever used. Hostel World allows travelers to read reviews of other travelers who have stayed in certain hostels. What I like the most about this website is that it doesn’t allow anyone to post to it unless the person made a reservation in a hostel through that site. 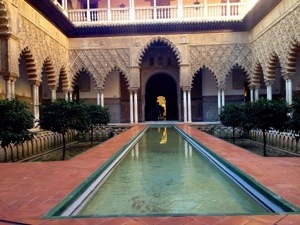 For example, I booked the hostel (The Garden Backpacker) in Seville using my information, so only I can write a review fit. This hostel had amazing reviews and my own review of it is no different. We elected to stay in a 12 person room which was the cheapest option for us- only 14 dollars a night (two total nights). The hostel offered very large, sturdy lockers, free wifi, friendly staff, down-to-earth guests, and the best part: free sangria each night made with lemons picked THAT DAY from a lemon tree in the garden! The hostel was located in a very central part of the city, making it easy for us to get around (with a map, that is. 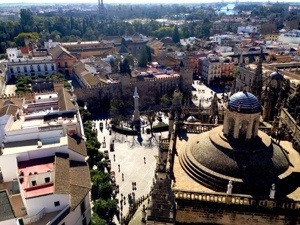 The streets of Sevilla are narrow, winding, and lead to many different plazas that all looked the same to me). I’m so glad we used hostel world to choose such a nice, safe, friendly place! 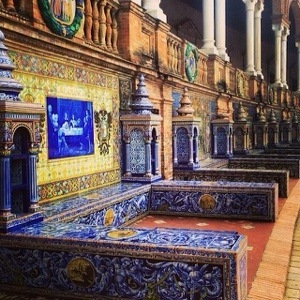 Three years ago I posted a picture of this plaza on Facebook and told the world that someday I would go to Spain. Not knowing it then, I would end up in that very place! The Plaza is beautiful and the warm sun was definitely enjoyed! Bordering the large, arched building (THAT LOOKS LIKE A CRESCENT MOON FOR ANY SISTERS READING THIS) are little blocked areas that represent each city in Spain. 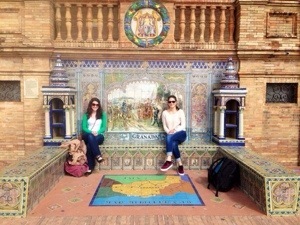 Of course, I took a picture with my roommate next to Granada! There were so many beautiful scenes and colors to look at, it was almost overwhelming! But we took our time and viewed each little detail and soaked it all in. 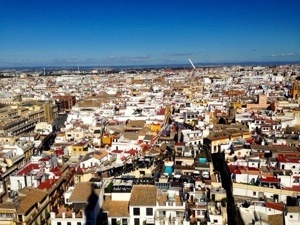 It’s probably the most beautiful man-made thing I have seen thus far in Spain. I enjoyed most the colors of the plaza. It took us about three hours of wandering the streets of Sevilla to realize that we should probably find a map to use (considering the sun was starting to go down). We walked back to the bus station, clumsily choosing the wrong roads, and found maps on the sides of the bus stops. Once we finally found our hostel, we locked up our backpacks and hit the town! Anyway, she suggested Bar Alfalfa. In a rather care-free way, we wandered out again without a map until we came across the bar. My roommate is a good guesser at the game of “let’s pick a street”, because we got there in very short time. The menu clearly labeled both vegan and vegetarian options, so we really loved that! We both enjoyed a tapa and a beverage and then shared a second tapa! 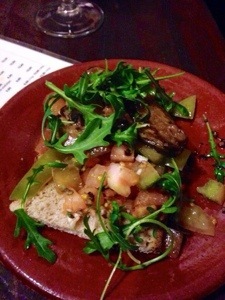 I chose an eggplant bruschetta and it was delicious! The next day we explored all the touristy places, but that’s okay because we learned and saw so much! We started our day with tostadas with olive oil and tomato and of course, cafe con leche. We then visited the Real Alcazar which is very similar to the Alhambra in Granada, but the gardens are far more beautiful in my opinion. 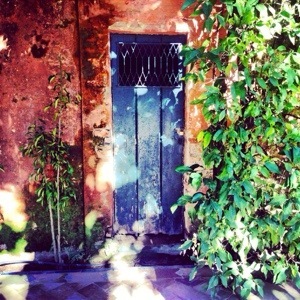 We liked getting lost in the hallways of the palace and the mazes of garden walls. 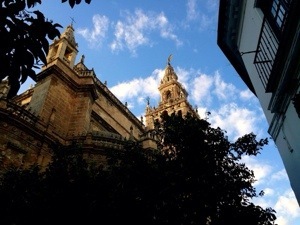 After that, we went to the cathedral (which we realized that we haven’t even done yet in Granada)! It was super cheap for us because we are students. The normal price was 10 euro and we got in for two! Was the Flamenco show that we saw on Saturday night! It was incredible! We got to look around the only flamenco museum in Spain. It was really nice to see the way the such a beautiful art has transformed. Flamenco isn’t solely dance. Its guitar, rhythm, song. Its incredible. The guirar player was so incredibly talented and was very entertaining to listen to. I sat in the second row. I was so close that I could feel the wind of her dress when she spun and felt the sweat of the dancers fly off their face. I will definitely go back to another flamenco show while here. This week I participated in an intercambio which is where a bunch of English speaking students get together with Spanish speakers and practice both languages. I had an awesome time chatting with new people! I love getting the practice. I speak a lot with my host mom, but these were new people to share new ideas with! I am also volunteering to host workshops teaching English to beginning level Spaniards. I will be practicing teaching and am so happy about it! Tuesday I taught parts of the body and phrases that go with it like doctor vocab or how to express pain and next Tuesday I will be teaching directions (per request of my pupils). It’s not a grammar class, it’s more for conversation and vocab (which is great because no one likes grammar). That’s basically it. Just exploring the city in the rain every day after school and every day finding a new street or new store 🙂 Thanks for your interest!